BACKGROUND: Worldwide, the ownership of public organisations has been transferred to the private sector through privatisation. The poor performance of public organisations has necessitated privatisation of these organisations. AIM: This article explored management perceptions regarding factors impacting the privatisation of parastatals in a developing country, namely Zimbabwe. SETTING AND METHOD: A comprehensive literature study provided the theoretical framework for this research. Primary data were collected by means of a survey obtaining 301 self-administered structured questionnaires from 27 parastatals in Zimbabwe. Seven null-hypotheses were tested using advanced statistical techniques such as regression and correlation analyses. RESULTS AND CONCLUSIONS: Factors identified in this study that could impact privatisation of parastatals in Zimbabwe are stakeholder consultation, stable macroeconomic conditions, government transparency and a well-developed privatisation process plan. If privatisation is implemented effectively, it could lead to increased organisational performance, effective governance and economic empowerment. It also appeared that variables such as union consultation, role ambiguity, political intervention, attractiveness to foreign investment and government commitment do not exert a significant influence on perceptions of privatisation. Practical guidelines were also provided to enhance the implementation of privatisation in parastatals. Governments all over the world took over the control of organisations after the Second World War through nationalisation. However, many countries have since reversed this trend and the ownership of nationalised organisations has been transferred to the private sector through privatisation (Burns, Katsouros & Jones 2004:66). According to Dore et al. (2008:186), in 2006, Zimbabwe had 76 public organisations of which 60% had been inherited from the Rhodesian administration. These parastatals were adopted or created to provide essential social services to the public, economic stabilisation and the equitable distribution of resources. State ownership of these organisations was also linked to the government's socialist ideology and an inward looking economic strategy (Tambudzai 2003:165). Dore et al. (2008:189) note that over the years, parastatals in Zimbabwe have suffered huge losses. Lack of profitability by these organisations has resulted in their low capacity to sustain their operations financially. Parastatals are usually an uneconomical way of doing business as they are characterised by heavy losses, budgetary burdens, poor services, mismanagement and political interference (Akpan 2002). Nellis (2007:11) argues that in an effort to address the poor performance and financial losses of public organisations, proponents of privatisation accelerated the privatisation process without sufficiently addressing the fundamentals on which a successful privatisation programme would be based. Government, as the provider of essential services to the public, has been left with no option but to subsidise their operations so that they continue to provide necessary services to the public. The growth rate of these subsidies has not matched the growth of the economy, thus raising government concerns (Sikwila 2010:1). The impact of privatisation on performance in low-income countries requires the improvement of a wide range of institutional issues such as the political, legal management and financial capacity in these countries (Parker & Kirkpatrick 2007:526). The failure to deal with these constraints prior to privatisation may lead to imperfect markets, or a monopoly, at the expense of a competitive and dynamic economy, as argued by the proponents of privatisation. In Zimbabwe, the privatisation process has been criticised for its slow pace, its impact on the general public and the economy, as well as the efficiency and transparency of the process (Tambudzai 2003:166). Furthermore, there are about 12 stakeholders who are involved in the privatisation and commercialisation of parastatals in Zimbabwe. This situation has created confusion in the privatisation programme through the promotion of clientelism, patronage and the quest of rent-seeking actions (Dore et al. 2008:197). The aim of this article is to test the hypothetical model of the study by investigating management perceptions regarding five possible factors impacting privatisation of 27 parastatals in Zimbabwe. The first part of the article covers the introduction and background to the study, problem statement and research objectives. This is followed by a literature overview of privatisation, hypotheses and the research methodology adopted for this study. The last part covers the empirical results and highlights the main conclusions and recommendations. According to Parker and Saal (2003:25), throughout history, the ownership of production and commerce has always been provided by the public and private sector. This arrangement has raised the question whether the means of production or directing commerce should be under the ownership of the state or under private control. Clifton, Comin and Fuentes (2003:5-6) are of the opinion that underperforming public organisations should be privatised; this could lead to the private sector having the sole responsibility of doing business. Still, a vast amount of literature both for and against privatising public services has been developed. A growing field of enquiry around alter-natives has emerged, albeit in a fragmented and inconsistent way. The literature in this regard tends to be highly localised and sector-specific and lacking conceptual and methodological consistency (McDonald & Ruiters 2012:1). However, the focus of this study will be on factors impacting successful privatisation in Zimbabwe. The privatisation process in Zimbabwe has been criticised for its slow pace, its impact on the general public and the economy, as well as the efficiency and transparency of the process (Tambudzai 2003:166). Akpan (2002) notes that privatisation finds African governments unprepared and - considering poor conditions such as deteriorating economies, high unemployment, underdeveloped markets, inexperienced professionals and unstable political systems with weak bureaucracies - incapable of designing and implementing the privatisation process. Privatisation thus becomes a very difficult affair. Pamacheche and Koma (2007:12) argue that many African politicians and public officials benefit from parastatals as they are offered gifts, board memberships and future jobs for themselves and engage in corrupt activities such as procurement kickbacks. All these may no longer be possible after privatisation; hence, such governments resist the move to privatise organisations. The privatisation process in Zimbabwe has raised a great deal of criticism in the press by politicians, professional organisations and civil society. Although some research has been done on parastatals in Zimbabwe, the main contribution of this study is to add to the existing body of knowledge by developing a theoretical model which can be utilised in other developing countries. A total of 27 parastatals and 301 respondents was investigated to assess the impact of five factors on privatisation of parastatals in Zimbabwe. This could shed light on the complex and changing landscape of privatisation in developing countries. As this is a perceptual study of managers of parastatals, it assesses their perceptions of possible factors that could impact on successful privatisation in Zimbabwe. This led to the following research question to be addressed in this study: What are management perceptions regarding factors impacting the privatisation of parastatals in Zimbabwe? To critically review the literature pertaining to various aspects of privatisation. To empirically assess factors impacting the successful implementation of privatisation of parastatals in Zimbabwe. To provide managerial guidelines and recommendations on privatisation that need to be improved in Zimbabwe. According to Yonnedi (2010:537), privatisation can be defined as the change in the production of goods and services from the public sector to the private sector. Similarly, Von Weizsacker et al. (2005:4) posit that privatisation can be defined as all the activities which are meant to increase the participation of the private sector in the production of goods and services by decreasing government's participation in such matters. Mudambi (2003:583) defines privatisation as the adoption of any activity which reduces the role of government and increases the function of the private sector in the economy. According to Adeyemo and Salami (2008:402), parastatals or public organisations are organisations which are owned by the state or in which the state holds a majority shares, provide goods and services, has a separate management structure and carries out business activities. Macleod (2004:33) states that parastatals are organisations that collaborate with the state without forming part of its administration. According to Felsinger (2011:22), stakeholder consultation is a less formal process through which themes and policies of interest are discussed within or across stakeholder groups. Pamacheche and Koma (2007:19) state that the idea is to gather information on stakeholder views and to encourage them to participate in the process of formulating policy. According to Hough et al. (2008:53), the operations of all organisations are influenced by the external environment, which is characterised by government actions, different cultures of societies, population demographics, economic activities, legal issues, technological factors and the level of competition in the industry. Equally, Gomez-Mejia, Balkin and Cardy (2008:62) point out that the business environment of any country comprises factors which have an effect on the benefits, costs and risks associated with doing business in that country. Intervention by governments becomes severe when foreign ownership of businesses is shifted to government or citizens of a country through confiscation, expropriation and domestication. Governments throughout the world have used laws, regulations and institutions to influence and control business transactions in the economy (Rodriguez, Uhlenbruck & Eden 2005:383). Similarly, governments have a duty to determine the policies of doing business within its boundaries. According to Pamacheche and Koma (2007:18), governments must be very clear on the objectives of privatisation in order to put in place the necessary conditions for their successful achievement. Paterson, Blewett and Karimi (2006:2) state that the government should address structural reforms to ensure adequate investment legislation, improved security and infrastructure as well as streamlined and strengthened regulation. According to Pamacheche and Koma (2007:18), the lack of a proper institutional and regulatory framework, and not improper execution, has contributed to the failure of many privatisation programmes to achieve their intended objectives. It is important to design a suitable institutional and regulatory framework which will enhance the successful implementation of the privatisation process. Nellis (2005:7) notes that many of the privatisations in Africa have targeted small, less valuable and declining organisations in the manufacturing and industrial sectors as well as the service sectors of the economy. In comparison, the privatisation of infrastructure utilities has always made little to no progress as most African leaders prefer to address the problems facing parastatals through means other than a change of ownership. In addition, African governments usually hold on to a substantial amount of shares from the few infrastructure privatisations they would have done on the pretext of protecting the public interest from mischievous and poorly performing new buyers. Moreover, the governments hold back these shares with the hope of selling them when the new buyer has improved the value of the organisation. Parker and Kirkpatrick (2007:526) further argue that the lack of enthusiasm to privatise these high potential organisations, sluggish pace of sales, poor business and legal environments, shortcomings of government regulation and administration as well as the failure to sell all stakes has contributed to a lack of foreign investment in infrastructure privatisations. According to Zhou (2000:200), in Zimbabwe, as in most African countries, public enterprise reforms were implemented as a major component of structural adjustment programmes. The policy goals in Zimbabwe included the need to: reduce the budget deficit (emanating from loss-making parastatals), improve the operational viability of public organisations (through operational, organisational and managerial restructuring), and rectify historically-induced tilted ownership patterns in the economy - by economically empowering indigenous groups. The impact of privatisation on performance in low-income countries requires the improvement of a wide range of institutional issues such as the political, legal, management and financial capacity in these countries (Parker & Kirkpatrick 2007:526). According to Wohlmuth et al. (2004:328), privatisation transactions have increased in Africa, both in terms of the number and value of these transactions. Sikwila (2010) concurs that most of these parastatals have one thing in common: they have benefited from government subsidies extended to cover the costs resulting from their loss-making, non-specialised and misplaced managers, inefficiencies and inability to make sustainable profits. Notwithstanding the important role played by some of the parastatals in the provision of essential services such as energy and communications, their performance might have created a financial constraint to both public and private sector performance. Although Estrin and Pelletier (2015) argues that very few privatisation deals have occurred in post-2008 in Africa, there are a few success stories, such as Benin with the privatisation of the cotton and public utility sectors, such as Benin Telecom, Nigeria sold 15 electricity generating and distributing companies in 2013 and Chad sold 80% of the telecommunication sector. Godana and Hlatshwayo (1998:10) state that Zimbabwe inherited a large number of parastatals at independence - more than 60% were established before independence. The parastatal sector encompasses a wide variety of activities such as agriculture, manufacturing, mining, transport, energy, communication and finance. According to McDonald and Ruiters (2005:226), privatisation started being debated upon in Zimbabwe in the 1990s as part of a series of neoliberal economic reform packages; namely, the Economic Structural Adjustment Program (ESAP) in 1990-1995 and its follow-up policy, the Zimbabwe Program for Economic Transformation (ZIMPREST) in 1995-2000. Privatisation was then implemented after multilateral donors, business people and some individuals perceived of it as a universal remedy for the increasing economic challenges being faced by Zimbabwe and a decline in service delivery from many sectors. Zhou (2001:252) argues that from 1996 to 1998, privatisation was implemented without any legally constituted privatisation plan of action. Parastatals which were privatised by the end of 1999 included Dairiboard Zimbabwe Limited (DZL), the Cotton Company of Zimbabwe (Cottco), the Commercial Bank of Zimbabwe (CBZ), the Zimbabwe Reinsurance Company of Zimbabwe (ZIMRE) and the Zimbabwe Tourism Group of Companies (RTG). The criticisms of the bit-by-bit approach to privatisation in Zimbabwe resulted in the establishment of the Privatisation Agency of Zimbabwe (PAZ), in September 1999, which had a mandate of driving the privatisation process (Dore et al. 2008:196). Furthermore, in 2005, PAZ was renamed the State Enterprises Restructuring Agency. It is the responsibility of State Enterprises Restructuring Agency (SERA) to prepare an initial commercialisation and restructuring plan meant to highlight the reasons of restructuring and privatisation. This plan suggests the method of privatisation to be adopted and these recommendations were then submitted to the Inter-Ministerial Committee on Commercialisation and Restructuring of Public Enterprises (IMCCR) for approval by Cabinet. Thus, key decision making on the privatisation of organisations remained the prerogative of Cabinet and the IMCCP. Similarly, public share offering was used in the privatisation of Cottco, DZL, CBZ and RTG in order to create wider share ownership in Zimbabwe. Furthermore, other methods such as management buy-out schemes and employee share ownership schemes have also been used in the privatisation of Cottco and DZL so as to achieve the objective of economically empowering the indigenous people. Advertising in foreign media and foreign missions have also been used to target Zimbabweans living abroad. According to Mohammed (2008:13), privatisation as a policy option has created a deep economic disruption in Africa leading to a socio-ethnic crisis and political instability. Similarly, Masunungure and Zhou (2006:6) contend that privatisation policy prescriptions were embraced in Zimbabwe and other African countries in the early 1990s, largely as conditionalities for accessing the balance of payments under the ESAP. Consequently, in Zimbabwe, privatisation resulted in the retrenchment of many employees thereby deteriorating their wellbeing as a result of a lack of social network mechanisms. In addition, the privatisation of organisations in Zimbabwe resulted in more funds being drained than it generated. As a result of the lack of an autonomous privatisation institution to monitor the privatisation process, private financial intermediaries were paid undisclosed amounts during the valuation and listing of the organisations which were privatised (Masunungure & Zhou 2006:6). Zhou (2000:215) argues that the weakness of policy documents in Zimbabwe is that they do not clearly spell out the strategies that will be used to ensure the economic empowerment of indigenous groups during the privatisation process. Tambudzai (2003:188) claims that the trade unions have, however, criticised the programme for lack of proper legislation dealing with workers' issues and transparency when it comes to government and management teams. Similarly, Masunungure and Zhou (2006:7) argue that Zimbabwe did not put in place a consistent legal framework and specific defence schemes to support the indigenous agenda. Dore et al. (2008:195) postulate that the framework for reforming public organisations in Zimbabwe is a minefield as it is characterised by a multiplicity of pieces of legislation, institutions and, at times, policies which contradict each other, and even policy reversals. In light of the secondary sources analysed in this study, and particularly the models offered by Donaldson and Wagle (1995), Aboujdiryha (2011) and Mudambi (2003), a hypothetical model regarding management perceptions of factors impacting privatisation of parastatals in Zimbabwe was constructed (Figure 1). The proposed theoretical model shows that the perceptions of privatisation are influenced by five independent variables, namely stakeholder consultation, business conditions, government considerations, the institutional framework and management of the privatisation process. These perceptions then impact on the two dependent variables, namely economic benefits and organisational performance. H01: Stakeholder consultation does not influence perceptions of privatisation. H02: Business conditions as measured by attractiveness to foreign investment and macroeconomic conditions do not influence perceptions of privatisation. H03: Government consideration as measured by perceptions of trust, political intervention, role conflict and role ambiguity does not influence perceptions of privatisation. H04: The institutional framework as measured by transparency, two-way communication as well as the speed and replicability of the privatisation process does not influence perceptions of privatisation. H05: Management of the privatisation process does not influence perceptions of privatisation. H06: Perceptions regarding privatisation do not influence the economic benefits as measured by perceptions of investments, competition, improved services, effective corporate governance and economic growth. H07: Perceptions regarding privatisation do not influence organisational performance as measured by perceptions of customer satisfaction, organisational efficiency and innovation. This study has adopted the positivist research philosophy. Quantitative study emphasises the measurement and investigation of underlying relationships between factors, not processes. It is concerned with examining numerical data. The approach draws a large and representative sample from the population under study and attempts to generalise to the whole population. The population of this study was all parastatals operating in Zimbabwe. According to Zimbabwe Government Online (2011), there are 69 parastatals operating in Zimbabwe. They represent a wide spectrum of sectors, which include agriculture, transport, energy, finance, environment, education, telecommunications, health, industry and trade, information, commerce, science and technology, tourism, water and mining. The study was conducted in June 2012. In this study, a sample of 27 parastatals was selected from the study population using a probability sampling technique, namely simple random sampling. The simple random technique was used because it gave every parastatal an equal opportunity of being selected. Within each parastatal, respondents were then selected on the basis of convenience and accessibility. A total of 700 questionnaires were distributed and 301 usable questionnaires were received (effective response rate of 43%). Section A investigated the impact of five factors on perceptions regarding privatisation in Zimbabwe. A seven-point Likert-type ordinal scale was used. A total of 50 statements were used. Section B assessed the perceptions regarding privatisation. A seven-point Likert-type ordinal scale was used (9 statements). Section C examined the outcomes of privatisation. A seven-point Likert-type ordinal scale was used (22 statements). Section D assessed the demographical characteristics of respondents by means of a nominal scale; nine categorical variables were used. Items to measure each variable were developed by using self-developed items based on literature and items whose reliability and validity have been confirmed in previous research studies (e.g. Mohd 2011; Mosavi, Amirzadeh & Dadmehr 2011:5910; Vo & Nguyen 2011; Yonnedi 2010). Secondary data were collected from books, journals, and Internet as well as library databases. Self-administered structured questionnaires were used to collect primary data from managers in the selected parastatals during a survey. These questionnaires were completed by the participants without the assistance of an interviewer. Primary data were collected by the researcher with the assistance of two fieldworkers who were recruited for this exercise. This study employed quantitative methods of data analysis, such as descriptive statistics, frequencies, factor analysis, regression analysis and correlation analysis. Construct validity (convergent and discriminant validity) was used to measure whether the constructs of the study measured what they intended to measure by means of exploratory factor analysis. Both face and content validity were also ensured by means of conducting a pilot study and using the expert judgement of a managerial and economics researcher and statistician. Reliability of the measuring instrument refers to its consistency - that is, the degree to which a measuring tool will produce the same results when applied more than once to the same group under similar conditions. The assessment of the internal reliability of the instrument was done by means of calculating Cronbach's alpha values. The empirical results were analysed and presented based on the measuring instrument (questionnaire), the layout of which is presented in Table 1. The demographic profile of the sample is summarised in Table 2, which indicates the frequency distributions for the nine categorical variables (data classification) used in this study. The results indicated that most of the respondents occupied middle management and supervisory positions (34% and 39% respectively) and were mainly male (77%). The results also indicated that the respondents were mainly aged between 31 and 40 years and 41 and 50 years (27% and 38% respectively) and had attained 'A' level/diploma or a bachelor's degree (32% and 30% respectively). Thirty-one per cent of the respondents had been employed at their parastatal for 21 years or more. Most of the respondents were employed in the infrastructure development industry (24%) and communication industry (23%) and what could be regarded as larger parastatals (86%), employing more than 200 people and have been in existence for more than 21 years (85%). The first stage of the data analysis was to evaluate the discriminant validity of the instruments used to measure the variables. This was done by means of exploratory factor analysis. The exploratory factor analysis was done by using the computer program STATISTICA (Version 10). In this study, a loading of 0.5 and above was considered significant to confirm convergent validity. A cut-off point of three (3) items loading in a factor was considered significant in this study. The individual exploratory factor analyses are not included in this article, but the combined factor matrix is (Table 3). As some items were deleted (below cut-off point of 0.5) and some variables loaded onto different factors, some factors had to be renamed or new factors formed as a result of the discriminant validity assessment during the exploratory factor analysis. The original theoretical model therefore had to be adapted and the reliability of the new and adapted variables had to be reassessed. As a result of the renaming and re-specification of the variables, some of the hypotheses also had to be renamed and subjected to empirical verification. Stakeholder consultation loaded as stakeholder participation (SP) and union consultation (UC). Business conditions loaded as attractiveness to foreign investment (AFI) and stable macroeconomic conditions (SMC). Government considerations loaded as role ambiguity (RA) and political intervention (PI). Institutional framework loaded as government transparency (GT) and government commitment (GC). Management of the privatisation process loaded as the privatisation process plan (PPP) and privatisation process implementation (PPI). Perceptions of privatisation (PP) loaded as one factor. Economic benefits loaded as effective governance (EG), competitive advantage (CA) and economic empowerment (EE). Organisational performance (OP) loaded as one factor. The Cronbach's alpha coefficients of the latent variables based on the comprehensive exploratory factor analysis were all above the cut-off point of 0.6 (Table 3) and, as such, all the variables were considered for further analysis (Blaikie 2003). The removal of individual items used to define constructs from any of the variables did not improve their internal reliability and therefore the individual items were all retained (Table 3). Multiple regression analysis was used to investigate whether the identified independent variables had a considerable influence on management perceptions regarding privatisation. 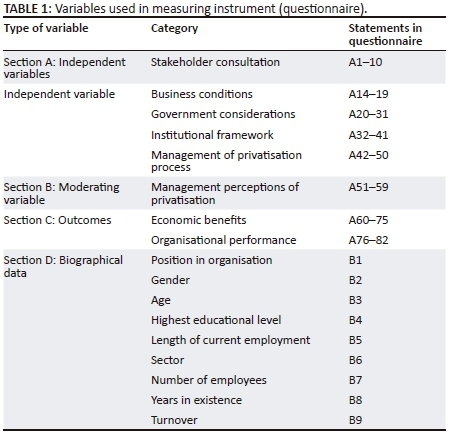 As indicated in Table 4, the coefficient of multiple determination (R2) of 0.536 points out that 54% of variability in the model is explained by perceptions of privatisation. 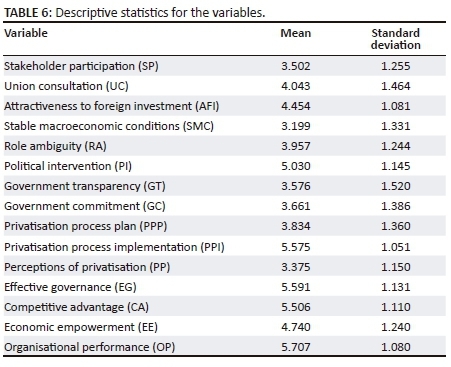 Results showed that stakeholder participation (SP) (b = 0.114, p < 0.044), stable macroeconomic conditions (SMC) (b = 0.093, p < 0.047), government transparency (GT) (b = 0.098, p < 0.034) and privatisation process plan (PPP) (b = 0.400, p < 0.000) are all positively related to perceptions of privatisation. Privatisation process implementation (PPI) (b = −0.116, p < 0.026, r = −0.106) has a negative influence on perceptions of privatisation. The variables union consultation (UC) (0.03), role ambiguity (RA) (0.002), political intervention (PI) (0.003), attractiveness to foreign investment (AFI) (0.030) and government commitment (GC) (0.042) do not exert a significant influence on perceptions of privatisation. 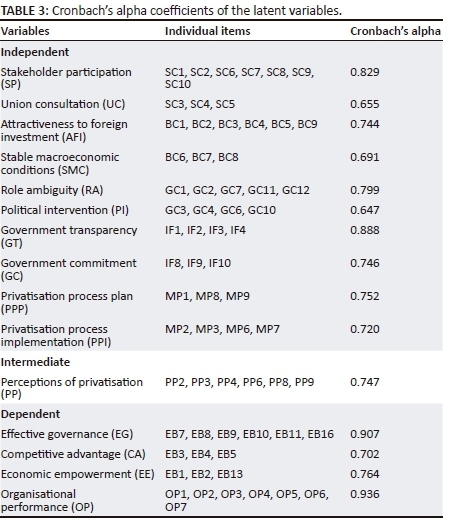 The results of the regression analysis of influence of perceptions regarding privatisation on dependent variables (Table 5) show a moderate relationship between perceptions of privatisation (t = 2.695) and effective governance (EG). They also indicate that perceptions of privatisation do not exert a significant influence on competitive advantage (CA) (b = −0.010). Perceptions of privatisation have a strong influence (t = 5.288) on economic empowerment (EE) and a moderate influence (t = 2.577) on organisational performance (OP). A correlation analysis was conducted to show whether relationships existed between two variables and also to show the overall strength of the relationships (Burns & Burns 2008:342; Cramer 2003:16; Hair et al. 2007:367). A statistical correlation coefficient (r) takes values which are between −1.0 and +1.0 (Burns & Burns 2008:343). A detailed correlation matrix falls beyond the scope of this article. All the variables had positive correlations with one another. In analysing the mean scores of variables obtained from the empirical study (Table 6), it appears that most of the scores cluster around point four (neutral) on the scale. For political intervention, it appears that respondents tend to somewhat agree (point five) with the statements. For privatisation process implementation, effective governance, competitive advantage and organisational performance, it appears that respondents agree (point six) with the statements. The standard deviation score for all the variables (Table 6) seem to be relatively high (above one), indicating some variability around the mean score. As a result of the formulation of the adapted model, the seven null-hypotheses initially tested had to be reformulated (Table 7). The empirical results show that there is a significant correlation between stakeholder participation and management perceptions of privatisation (H01.1 rejected). The empirical results indicate that management perceives that not all employees, managers and customers participate in the privatisation process, that there are not shared goals and that privatisation is not done within a framework that ensures access to information pertaining to privatisation. Stakeholder participation is thus important during privatisation because these stakeholders can easily disrupt the process if they do not actively participate and reduce opposition to the process. Stakeholders could offer valuable input when designing and implementing privatisation processes, and the participation of stakeholders fosters government commitment, while the availability of relevant information could lead to a credible process. The empirical results also reveal that there is a significant positive correlation between stable macroeconomic conditions and management perceptions of privatisation (H02.2 rejected). Findings indicate that parastatals do not operate in a stable macroeconomic environment that encourages government to privatise its organisations and government is implementing macroeconomic stabilisation policies that assist in achieving successful privatisation. Government should ensure that there is limited financial sector distress in order to achieve successful privatisation so that the country can attain its anticipated economic growth. The findings of this study show that government transparency has a significant positive correlation with management perceptions of privatisation (H04.1 rejected). Information regarding the bidding process, policies and guidelines regarding privatisation should be accessible to all parties involved in the privatisation process. Transparency should be enhanced by informing and educating the public so that they can be active participants in the privatisation process as well as engaging professional institutions to look into the backgrounds of the potential investors. The empirical results further show that the privatisation process plan has a significant positive correlation with management perceptions of privatisation (H05.1 rejected). The results indicate that the privatisation process is guided by a formal plan of action and that the schedule of all parastatals identified for privatisation is equally accessible to all stakeholders. Whenever governments embark on a privatisation programme, it is important that a clear plan, accompanied by proper implementation, supervision and an effective evaluation process, is put in place so that the privatisation objectives can be achieved. The study revealed that the privatisation implementation process has a negative relationship with management perceptions of privatisation (H05.2 rejected). The results indicate that there is a lack of structural capacity to enhance the privatisation process and that there is no autonomous institution to lead and manage the privatisation process. The results also indicate that there is a lack of proper valuation of assets to enhance the credibility of the privatisation process. Successful privatisation could be achieved through the engagement of professional institutions in the valuation of organisations identified for privatisation. 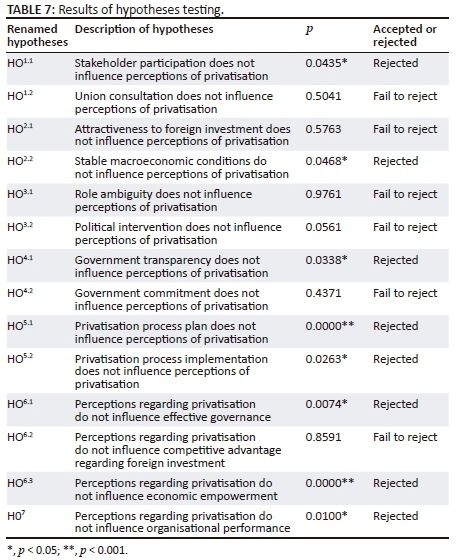 The empirical results also indicate a statistically significant relationship between perceptions of privatisation and effective governance (H06.1 rejected). Government should be aware that privatisation improves service delivery by offering high-quality goods and services through the employment of qualified employees and put in place all the critical factors of implementing successful privatisation so as to realise economic growth. It appears that there is a statistically significant relationship between perceptions regarding privatisation and economic empowerment (H06.3 rejected). It is therefore important for citizens to participate in the economic activities of their country, such as privatisation, so as to economically empower them. It appears also that there is a statistically significant relationship between management perceptions of privatisation and organisational performance (H07 rejected). Government should employ qualified staff or engage them in training sessions so that they can develop their competencies to deliver better services to their customers, and competent managers who have the capacity to plan for the operations of their organisations so that they become innovative and proactive. If privatisation is properly implemented, it seems that these could be positive outcomes of this process. Based on the empirical results and revised hypothetical model of this study, eight of the 14 tested variables showed statistically significant relationships. Three independent variables, namely stakeholder participation, stable macroeconomic conditions and government transparency, could impact the privatisation process plan and implementation of the privatisation process, which ultimately have an impact on effective governance, economic empowerment and organisational performance. The main research question of the study was to assess management perceptions regarding factors impacting the privatisation of parastatals in a developing country such as Zimbabwe. This study has contributed to the existing body of knowledge by developing a theoretical model which can be utilised in other developing countries, where capital markets are underdeveloped, to test perceptions regarding the privatisation of parastatals. 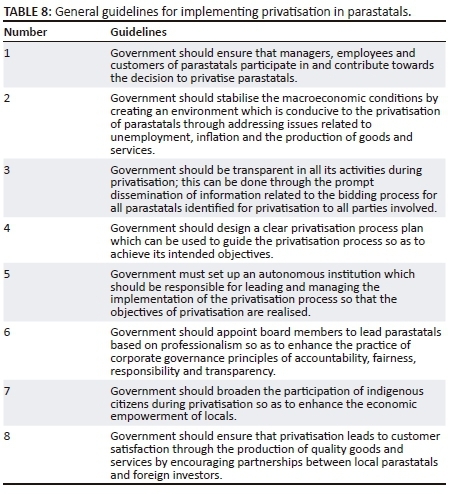 The model identified five factors that could impact on privatisation of parastatals, namely stakeholder consultation, business conditions, government considerations, institutional framework and management of the privatisation process; if correctly implemented, these factors could lead to economic benefits and increased organisational performance. This model will act as a foundation for other studies investigating the factors influencing perceptions of privatisation and the outcomes of privatisation in a developing country. The empirical results of this study led to the conclusion that management perceived the privatisation of parastatals as being implemented without adequate participation of stakeholders or union consultation; as a result, their roles in privatisation were not clear. Management also perceived the macroeconomic conditions prevailing in Zimbabwe as unstable, hence failing to attract foreign investment could decrease the chances of successful privatisation. Furthermore, management perceived political intervention as hindering progress during the privatisation process. The empirical results also indicate that management underestimated the importance of a privatisation process plan and that there was a need for an autonomous institution to manage privatisation in Zimbabwe. Management was of the opinion that information regarding issues such as the bidding process, regular feedback to stakeholders, clear guidelines and policies regarding privatisation as well as upward and downward communication processes were not accessible to all parties involved in the privatisation process. Furthermore, management indicated that the lack of government commitment has slowed down the privatisation process and that there were many key role players in the privatisation process in Zimbabwe. The National Center for Policy Analysis (2013) alleges that, although governments increasingly embrace privatisation, they often underestimate the benefits arising from it. When implemented with care, due diligence and with a focus to maximise competition, privatisation is an approach that put results, performance and outcomes first to deliver high-quality public services at a lower cost. Some general guidelines for implementing privatisation in parastatals are provided in Table 8. The study was carried out during a time when Zimbabwe was experiencing an unstable macroenvironment as a result of a fragile Government of National Unity. This situation could have contributed to respondents having to provide biased responses in an effort to secure their jobs. There were challenges in obtaining permission to carry out research in some parastatals for security reasons. There is a possibility that the respondents could have answered the items in the way in which they viewed the items and not in the way in which the items were intended to measure the variables of the study. The use of a self-administered questionnaire did not allow the researcher to explain the items to the respondents. This study investigated management perceptions regarding the privatisation of parastatals in Zimbabwe. The model and measuring instrument developed in this study could also be used to assess privatisation in other developing countries. Other researchers could explore the impact of privatisation in respect of social issues, such as employment in Zimbabwe, as this study concentrated primarily on the economic outcomes of privatisation. Other studies could investigate privatisation methods that are suitable for use in Zimbabwe and other developing countries, as some of the methods previously used garnered criticism because they are viewed as favouring the rich. As this was mainly a perceptual study regarding privatisation in Zimbabwe, other studies could include a case study or desktop study of successful privatisation in Zimbabwe. The authors would like to thank the respondents of parastatals in Zimbabwe and Dr Eddie Tshuma for conducting the literature and empirical study. E.T. conducted the literature and empirical study, N.E.M. wrote the article and E.E.S. provided guidance throughout the study and finalisation of the article.